The following funds are held at the Community Foundation of Marquette County and currently have a net total of over $17 million. For more information or to find out how to contribute to one of these funds please contact the Community Foundation at 906.226.7666. Established to provide support for charitable, benevolent and other public purposes in Marquette County. Allows support of a special area of interest while taking advantage of the Foundation’s community expertise. Provides benefit to a selected organization or program. Established by an organization, individual or family to support the costs of a designated organization. Established to make grants according to the charitable interest of their founders. Established to inspire community members to pursue their desire for post-secondary education. 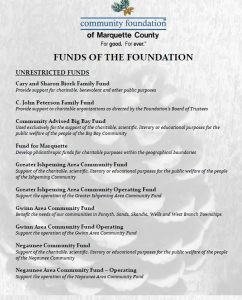 To download a complete listing and description of the funds of the Community Foundation of Marquette County, please see Funds of the Foundation.